Whenever you turn on the TV, no matter what channel you are watching or what kind of show is on, there is one thing you are certainly going to see: a bunch of pristinely white smiles. Of course, this is not a big surprise, because perfectly white teeth automatically means they are healthy, right? Actually, according to your dentist, just because a smile is pearly white does not necessarily mean that it is problem-free. What issues could be affecting your smile without changing the color? We share the most common ones today. Gum disease, also known as periodontal disease, is one of the most common and damaging dental problems across the globe. Left untreated, it can lead to chronic bad breath, tooth loss, and even make a person more likely to suffer a heart attack or stroke! However, its early symptoms are quite mild, including red, swollen, and tender gums that easily bleed. At this stage, while your gums might be affected, the color of your teeth will not. This is a big reason why many people with gum disease are completely unaware that they have it! Bruxism is a condition where a person unconsciously clenches their jaw and grinds their teeth, and for most, it only occurs while they are asleep. This exposes the teeth to a tremendous amount of pressure, and while it may weaken the enamel and strain the jaw, it does leave the color of the teeth relatively untouched. Some people are a little overzealous in their pursuit of a white smile, causing them to brush with too much force. Others believe that using a hard-bristled brush will help their smile look brighter, and while that might be true aesthetically, in reality, this kind of brush can literally wear down the enamel. This not only makes the teeth weaker, but it also makes them more susceptible to develop decay. Instead, opt for a soft-bristled brush and a gentle touch. This will clean your teeth just fine without damaging your smile in the process. It is also common for people to overuse over-the-counter whitening methods such as whitening strips. Leaving a strip or gel on for longer than the instructions recommend can damage your enamel and even your gums. When whitening your teeth without the supervision of your dentist, it is always best to be cautious. 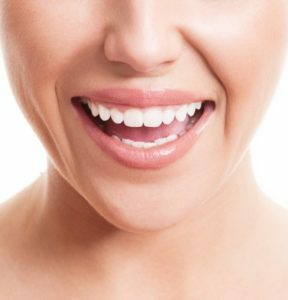 So what is the best way to achieve a smile that is both white and healthy? Fortunately, you are probably already familiar with the answer: consistent brushing, flossing, and visits to your dentist. Diligent home care and twice yearly dental cleanings will prevent stains from accumulating on your teeth and stop the development of gum disease, and regular checkups will allow your dentist to help if bruxism is an issue. Plus, should you ever want your smile to be dramatically whiter, they will be able to provide you with a safe and effective professional treatment that can brighten your smile without harming the enamel. While perfectly white teeth are fantastic, they are not the be-all-end-all when it comes to dental health, so be sure to maintain your home care routine and do not be a stranger with your dentist! That way, you will not only have a white smile, but a strong one you will be able to rely on for a lifetime. At Amherst Dental Group, our team of experts is committed to meeting all of your dental needs under one roof, and that includes providing a multitude of cosmetic services to give you a truly stunning smile. To learn more about how we can help you achieve the kind of smile you see on TV and in the movies, be sure to contact us today.